After a year and a half of waiting, Season 2 of American Gods has finally made its return to Starz. Since last season's finale, much has changed with the high-concept genre series. A behind-the-scenes shakeup found showrunners Bryan Fuller and Michael Green exiting the production in late 2017, with co-stars Gillian Anderson and Kristin Chenoweth following suit. Picking up exactly where Season 1 left off, Season 2 began with the Old Gods' big meet-up at the House on the Rock. They, along with Shadow Moon (Ricky Whittle), officially put Mr. Wednesday's (Ian McShane) vengeful plan -- of regaining relevancy in a world that continues to lean heavily on the modern luxuries of today -- into action. But with each God fueled by their own ulterior motives, it's pretty evident their journey to redemption will hit plenty of bumps along the way. Tonally, it feels like Season 2 is a reboot in multiple ways. Gone from the series is Bryan Fuller and Michael Green's high concept (and highly over-budget) stylistic storytelling aesthetics. While it feels like the show is refinding its legs, the rumors regarding the program's behind-the-scenes drama, which Neil Gaiman denies, has kept people questioning the future of the series. 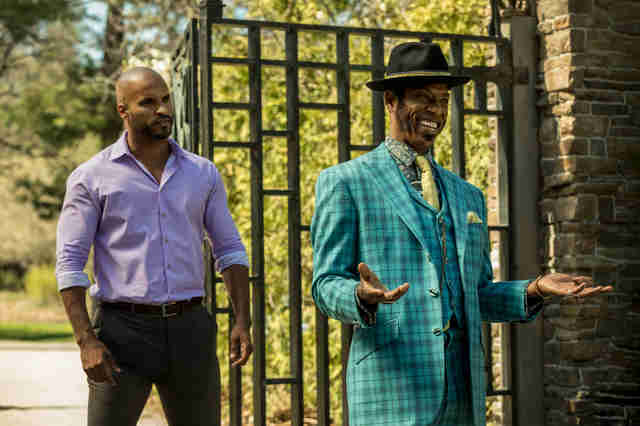 Thankfully, Orlando Jones, who added writer and producer to his list of responsibilities going into Season 2, is here to shed some light on things. With the recent renewal of the series for a third season, it looks like Neil Gaiman's epic tale of the war between the Old Gods and the New is just getting started. Thrillist spoke with Jones a few days before the season premiere, and during our lengthy chat, the actor shed some light on his career trajectory, from his early sketch comedy days to drama, the cultural importance of bringing Mr. Nancy to life, the new direction the show is taking, and of course, being an unabashed Neil Gaiman fanboy. Thrillist: What drove you to move from doing comedy to genre entertainment like American Gods? Orlando Jones: You know, I always think my perspective on it is probably more twisted. Because, the way I remember it is more like I left MADtv, and then the first two films of note that I did were Liberty Heights with Barry Levinson and then Magnolia with Paul Thomas Anderson. So for me, doing that after MADtv was a really weird thing. Because once that happened, when I went to try and do a lot of the comedy work that I did later, people said, "He doesn't do comedy!" And literally, I was like, "What are you talking about? I was on MADtv!" After those two films, it was a real weird uphill battle in Hollywood to get back into the comedy game -- and I haven't done a comedy now in probably, gosh, maybe 12 years. It wasn't lost on me either that I was on MADtv on Fox and now I was starring in a one-hour supernatural drama on the network. For me, it's really just about creating characters that, frankly, are not just funny, or not just dramatic, but are more fully realized characters. And so when I look at sort of the juxtaposition between the amount of screen time I'm going to have and the scenes that I'm in, how can I best shape a character that's going to make people understand the plight of what he and the story is trying to accomplish? For Mr. Nancy on American Gods, it feels like all of your comedic and dramatic sensibilities are rolled up into one character. Now that Neil Gaiman entered the mix, how has your perspective of Mr. Nancy changed? Or has it? Jones: I'm a writer and producer on the show, so in that sense, with American Gods, I'm there and writing a large section of the show. That probably adds a whole new layer of responsibility in telling this story. Jones: Suffice to say, I know where all the bodies are buried. But I also think there's been a lot of -- how do I put this? There's been a tremendous amount of misinformation. But each part of the misinformation is authentic in the sense of looking at it from the perspective of the people talking about it -- what they're saying makes sense. But it's not what transpired. 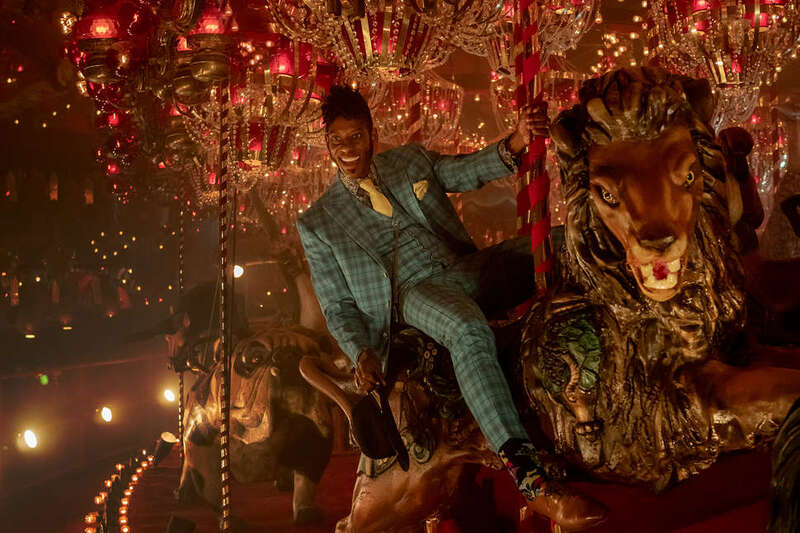 The way I'll best answer your question is this: American Gods is 100% based on the genius work of Neil Gaiman and I am a true, real-deal Neil Gaiman fan. But it's also very much based on the characters that Bryan Fuller, Michael Green, and the actors themselves created in Season 1. And that's a bit of a departure from the book simply because if you really look at the representation on American Gods, it is more-so than the book. You know, Laura Moon and Salim and the Jinn and Mr. Nancy and Bilquis and Mad Sweeney -- they were all characters who are obviously in the book but they occupy much larger roles in the show. It's an aspect that's rather fascinating, given that Shadow Moon is the main focal point in the book. Here, it feels like everyone has an equal piece of the pie. Jones: Right. I think the other difficulty for us is that in the creation of Mr. Nancy, he was not introduced in the book on a slave ship. So his introduction so fundamentally changes so many things about how he enters into this story. I wanted audiences to recognize the character because, you know, I'm fangirling Neil Gaiman this character for 20 years! I definitely wanted people to recognize Mr. Nancy, but by that same token, I wanted them to also recognize Aunt Nancy and Kwaku Ananse and Kompa Nanzi and all of those Anansis as you go through all the different cultures that are related, but slightly different. They are a part of what Neil based the character on but they're not a part of the way the character was necessarily rendered in the book. Then, is it safe to say that the importance of bringing this character to life transcends the genre story you're telling? Jones: From the accents that he will take on, which are a part of the culture that he came from, which represent the slave trade and the Middle Passage that ultimately are where those stories resonated -- and because I am a direct descendant of the Southern United States and those stories -- surviving that passage and becoming a part of the lineage of my great grandparents, my grandparents, and then handing that lineage to me as a child, I met Anansi as a spider long before I knew who Neil Gaiman was. So for me, to honor my fangirl side to an author who is brilliant and groundbreaking, not just with his work, but also in the way that he approached characters and race and gender. He was doing this 20 years ago when no one had thought about it. This authenticity, to me, is to be honored and respected. 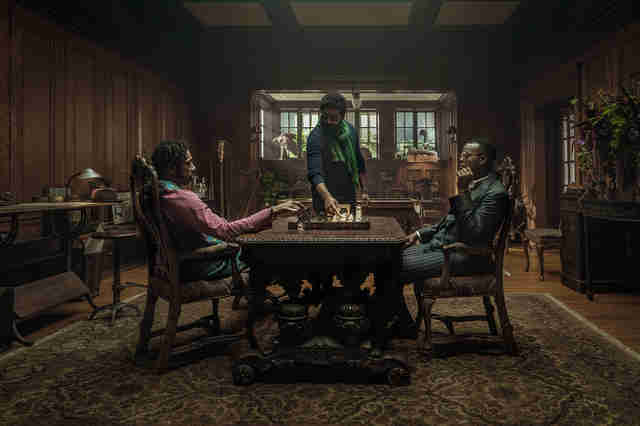 There are a variety of relevant issues explored throughout Season 1 of American Gods: Immigration, America's identity crisis, and cultural representation, to name a few. What do you think is the important theme audiences should take away from Season 2? Jones: I think this season is very much about awakening and activation. I think that what we were fortunate to be able to do in Season 1 was to sort of lay out so many of these things and to put imagery that was thought-provoking and provocative and beautiful around these things. But having the characters actually be activated and doing something and not just talking about it is critically important to Season 2. The question becomes for Nancy, for all the characters: How can we take this story and tell the story to someone who can actually do something? That's a far more difficult thing to do. I think that's a lot of what Shadow is working through, because he's two weeks out of prison, and certainly institutionalized and is being brought into this crazy world of the Gods that he never knew existed. But at the same time, there does come a point where he does have to make some decisions, and you can't just float through it. We can only allow that to happen for so long. And fortunately, because it's only been two weeks, we have the license to do that. He can't just keep following Wednesday around and consistently get lynched and be kidnapped -- at a certain point, he's got to get away from this guy. But by the same token, we're really trying to do that for a number of the characters around those themes. Speaking of characters, Season 2 is seeing some new Gods entering the mix, while some fan favorites won't be showing up at all. How does that play into the grander scheme of things? Jones: There was all this controversy... I'm captain of the Gillovney ship in The X Files fandom, so Gillian [Anderson] going was crazy to me! But it made sense because to really be playing out old media in American Gods in 2019 is just lazy. That is the stupidest thing we could do. New Media is it and new media is global. What does new media look like? And I'm not talking about American media, because American media is no longer the predominant media as it once was. There's K-Pop, and K-Pop has been around for a long time and it's wielding massive audiences. And in our storytelling arcs as American storytellers, we pretend that doesn't exist? How could you even talk about media without looking at the stars that are coming out of Asia and looking at the different bandwidth they have? The different technology they have? What Hong Kong and China are like in terms of tech. And what it's capable of versus the somewhat Dark Ages we're in in America. So, is this aspect of the American Gods story going global in Season 2? Jones: For us, it was very much about: Let's talk about media from a female perspective on a global level. What does that look like? That's what new media needs to be. We have to have a conversation about the awakening of the understanding that media has changed, because one thing is definitely different. You and I both know that since the beginning of time, there's only been one-to-one and one-to-many -- those have been the only two forms of communication that have ever existed in human history. Well, 10 years ago, Twitter and the news feed on Facebook showed up and many-to-many communication was born. And since then, we have watched a slew of things happen. From people sending a tweet and being fired when they landed to using many-to-many communication to assemble a mob to fight or march or protest. So when we look at tech and new media, or as characters, for us, what's their awakening? What's Shadow's awakening? What's Bilquis' awakening? And how do these characters activate? Because they're activating, ultimately, in their own self-interest in this war, and before you can go to war the thing you first have to do is, you gotta get your house in order. So if you got somebody who you think is shaky, you're only as strong as your weakest link. You better shore that weakest link up fast before you get yourself into a full-blown battle.